If you’ve ever experienced the frightening moment of realizing you are too tired to be behind the wheel of a vehicle, we hope that you did the responsible thing of pulling over and getting some rest or letting another driver take the wheel. Unfortunately, many people think they can continue to drive just a little bit further and end up crashing their vehicle as a result of driving while sleep deprived. Drowsy driving can lead to a slower reaction time, aggravated or aggressive driving, loss of focus while driving, swerving into other lanes, or falling asleep at the wheel. Most often, drowsy driving affects those driving at night or in the early hours of the morning, but can happen at any time. Those who are more likely to drive drowsy include people who do not have regular working hours, such as truck drivers, irregular shift workers, pilots and airline employees, those traveling for work, or those driving on a long road trip. If you are injured in a drowsy driving accident in Texas, be sure you know who to call. The legal team at Alex R. Hernandez Jr. PLLC has experience handling personal injury cases involving sleep-deprived drivers and can work to try and get you the compensation you deserve for your injuries. Mr. Hernandez has worked hard to build a law firm that has vast experience handling personal injury cases involving car accidents, and has represented thousands of clients who have been injured in auto accidents. Our car accident attorney and team are here for you when you need us. Focus on getting enough sleep at night, especially if you have a long drive ahead of you. Keep provisions in your car in case you need to pull over and sleep for the night. You are more likely to follow your gut if you are prepared. This can include pillows and blankets, bottles of water, snacks, and even pepper spray, a taser, or a legally-carried firearm if you are concerned about safety. If you aren’t one to sleep in your car, make sure you know where the nearest hotel is and plan to break up long drives into several days. Travel with a buddy. Having a friend in the car can help keep you alert as well as be a backup to take over driving duties if you feel tired. Avoid drinking alcohol, taking drugs, or eating heavy meals before driving as this can all cause drowsiness. Take regular breaks while on long car rides. Get out, stretch your legs, and grab a cup of coffee. Call a cab, Uber, Lyft, or a friend to take you home. If you stay up all night and need to get home in the morning, utilize a ride service and worry about getting your car later. Perhaps another driver does not follow the above advice. Rather than pulling over when they feel themselves getting sleepy, they step on the gas to make the drive home shorter. If you have been in a car accident because of a drowsy driver, you could be eligible to receive compensation for injuries, medical bills, lost wages, or property damage and an experienced car accident lawyer can help you get there. 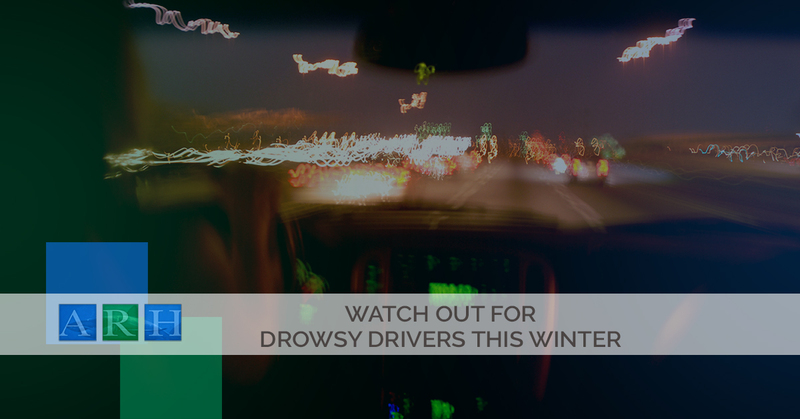 Drowsy driving is especially common during the winter. People load up with heavy meals, drive to work in the dark, are bundled up in a comfortable jacket and have that warm car heater keeping them cozy. All of this can lead to a driver becoming sleepy behind the wheel. When you factor in slick winter roads, it can be harder to gain control of a vehicle if a driver starts nodding off. As your Corpus Christi car accident lawyer, we work with those who have suffered injuries due to a negligent driver, including those who were driving while sleep deprived. Due to the workload of commercial truck drivers as well as non-traditional sleep and work schedules, truck drivers are susceptible to drowsy driving. When you factor in that many are driving a vehicle that weighs upwards of 80,000 pounds, the consequences of drowsy driving can be dire for everyone involved. If you or a loved one has been involved in a semi-truck accident and it is believed that the truck driver was sleep-deprived, get in touch with an experienced truck accident lawyer in Texas. Our legal team can help handle your case and fight to get you the compensation you deserve. If you have been injured in a car accident due to the negligence of a drowsy driver, we can help. You might be entitled to compensation for lost wages, medical bills, mental stress, long term effects, and more. Our law firm has experience dealing with personal injury cases involving sleep-deprived drivers and can take legal action against other involved parties. The ramifications of a car accident can be life-altering. Make sure you have a qualified legal team on your side. Get in touch with the legal team at Alex R. Hernandez Jr. PLLC today.